I’d completely disabled Flash Player on my Mac following John Gruber's solution. That works fine1 using Safari and cheating with Goolge Chrome when you need the Flash player; that is creating a quick keyboard shortcut2. I've used it for about one month but I was missing my preferred browser, Camino that I find really more stable3. Problem was that there is not a "Open Page With" menu in Camino and this is annoying when I wish to view a page with Flash content. 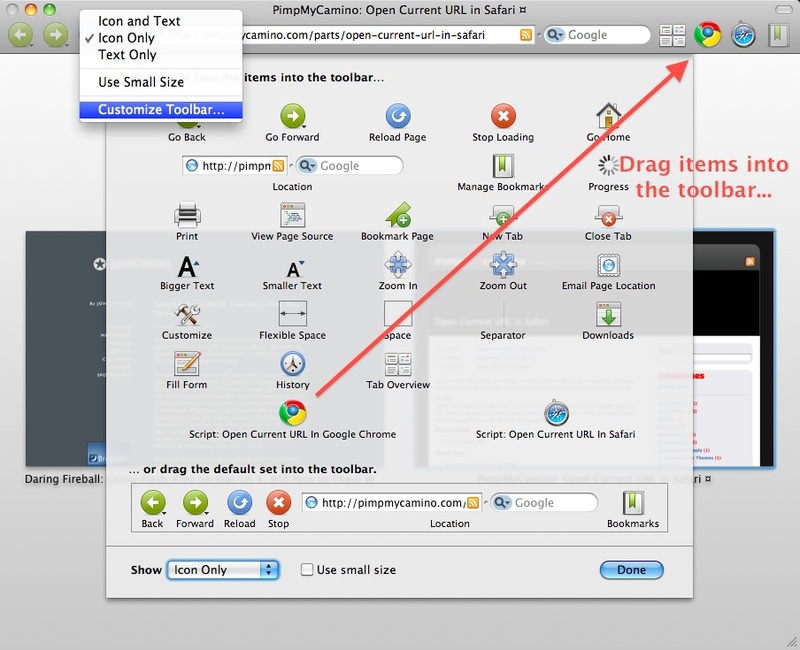 Solution came browsing PimpMyCamino with a little modification of Open Current URL in Safari. Is an applescript to put in your ~/Library/Scripts/Applications/Camino folder (create the folders if necessary). Then customize your toolbar in Camino to add it (Ctrl-click on toolbar to add script icon). Now when I am on a page in Camino with a Flash content I wish to view, just click on Chrome icon on toolbar and boom, Chrome launches and loads that page. Ctrl+click on toolbar to "Customize Toolbar…"
All credits goes to Open Current URL in Safari (for the script) and Google Chrome (for the icon). If you prefer to use a keyboard shortcut Phiw authored an Authomator workflow that appears in the Services menu on OS X 10.6. You can assign a keyboard shortcut using the Keyboard pane of System preferences (customise how to). The service should appear from the service when you run Camino (you might need to logout before the service is recognized). You can assign a keyboard short cut. 1. Removing Flash Player from /Library/Internet Plug-Ins/ prevents Safari and Firefox (and almost all other Mac web browsers) from loading Flash content, but not Chrome which includes its own self-contained Flash Player plugin. (Move “Flash Player.plugin”, “flashplayer.xpt”, and “NP-PPC-Dir-Shockwave” out of that folder and into a new folder you can create next to it named “Internet Plug-Ins (Disabled)”). Click the + button Select Safari as the Application. Type in Google Chrome as the Menu Title. Make the shortcut anything that isn't already in use (I used Alt-Cmd-G). 3. Don't know if my experience worth but I browse about 200+ sites a day and I'm using Camino during last 5 years whose crash I count on one hand fingers (equals to crash happened to Safari in one month). Give it a chance. I love its bookmarks keyboard shortcut and search in URL field but it has much more features.